Julia and Matt met while they were both working on a Disney Cruise ship. Julia grew up in Arizona and Matt grew up England. Because of this, much of their relationship has been long distance. Fortunately, their wedding was their first step in spending the rest of their lives together! Julia’s parents had dreams of retiring in the mountains of Colorado. They recently purchased a beautiful house on a large plot of land just outside of Telluride, Colorado. 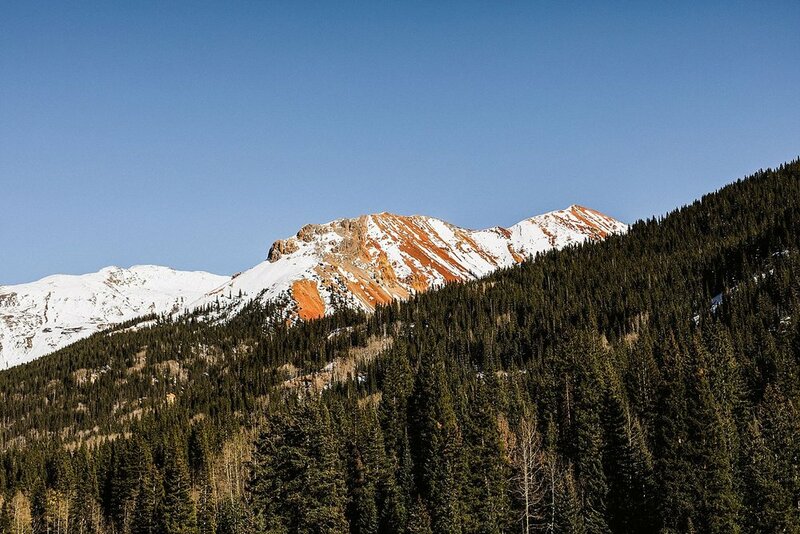 The property is perched high up in the mountains and has views of the surrounding San Juan Mountains. Julia and Matt knew that this was the perfect place for their elopement. They both got ready inside the house and then got married under a beautiful wooden arbor. Julia’s father officiated their ceremony and made sure to include a lot of pop culture references that he knew they would love. He quoted “The Notebook” by Nicholas Sparks, who is Julia’s favorite author. He also read a quote from “Harry Potter” and made a reference to “Lord of the Rings.” After the ceremony, they ended the evening with delicious drinks made by Matt and then they ate dinner at Rustico Ristorante, which was an incredible Italian restaurant on Main Street in Telluride. Julia and Matt hired us to be their elopement videographers on their wedding day. Then they hired us for a photography and videography Adventure Session the next day. We had so much fun spending two days with them and exploring the mountains and small towns near Telluride. We bonded over our shared love for dogs (they have an adorable puppy named Waffles, check out their film to meet him), our love for all things Disney, and our love for the mountains. Our adventure with Julia and Matt ended with their first dance on the top of a mountain, surrounded by gorgeous views and beautiful golden sunset light.